The North American subdivision of Volkswagen has unveiled the Atlas Basecamp Concept, a large seven-seat SUV reportedly ideal for long trips into the wilderness. 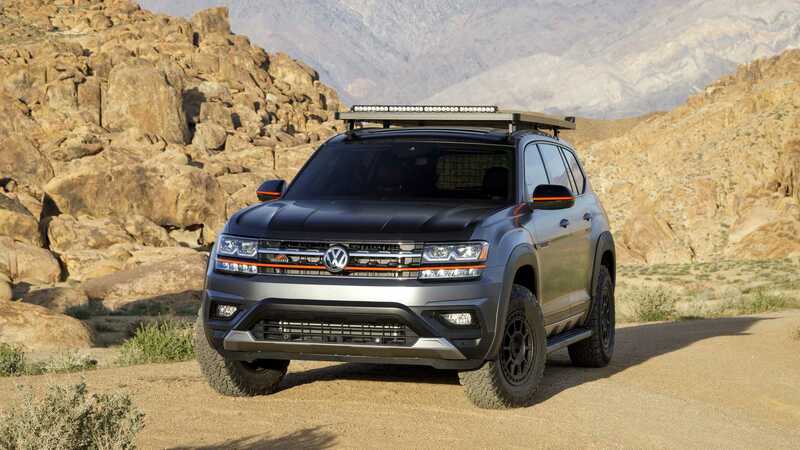 The car sports a black and grey paint with matte and orange accents and comes based on the SEL Premium trim of the original VW Atlas. It holds a six-cylinder engine with 3.6 liters of displacement, which produces around 279 hp (208 kW). It links to an eight-speed automatic transmission and an AWD system. The listed features include Air Design body kit, a suspension lift kit, auxiliary lighting, 17-inch wheels clad in off-road tires, and an expedition trailer with a bike rack outside. The trailer has a sunroof and contains a kitchen complete with fridge and sink, a bed, a portable WC, a CNG tank, and a water tank. The cabin of the car itself sports a digital dashboard, three-zone climate control, leather upholstery, heated seats (all of them), and a series of protective Volkswagen Accessories. The driver takes advantage of a parking assist, an all-around view camera system, and LED headlights. The Volkswagen Atlas Basecamp goes on sale priced from $48,400 in the United States.